This is a story you may have heard a little about and didn't even know it. The story of Mum the hermit is also known as the Kentucky Wild man. The story was published in the Newark Daily Advocate back in 1883. It seems many details get lost in the re-telling of this interesting case. Most just attribute the wild man to be a captured Bigfoot, but if you look at the details you may come to a different conclusion. A few days ago, I published the following photograph of the newspaper headline. It seems that there is some interest in the story, so I thought I would expand it here. 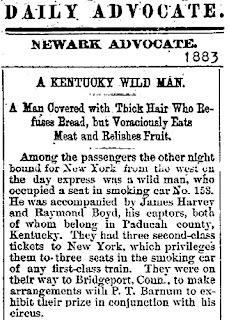 As you can see from this partial newspaper clipping these two gentlemen, James Harvey and Raymond Boyd, were on their way, via train, to New York. They were on their way to make an agreement with P.T. Barnum for their "prize", the Wild man. 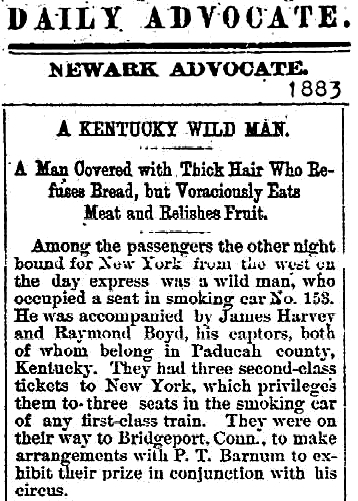 I think it is safe to assume the men were looking for a financial gain with their Kentucky Wild man. But who or what was this man beast? 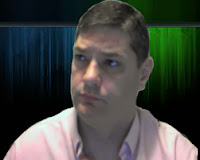 In the full article we can glean some details about him. We know on the day they arrived in New York the Wild man was dressed in normal human clothes but wore big cloth shoes. His hair was long and almost to his waist. His beard was was long and thick. The Wild man did not speak and rarely made any sounds at all. Sometimes he would make a low howl, that was described as sounding like a leopard. According to Boyd, the Wild man had thick brown coarse hair all over his body. That the hair was as thick as hair on a horse hide. The Wildman's palms looked like that of a bear. His finger nails were over an inch long and resembled the claws of an eagle. 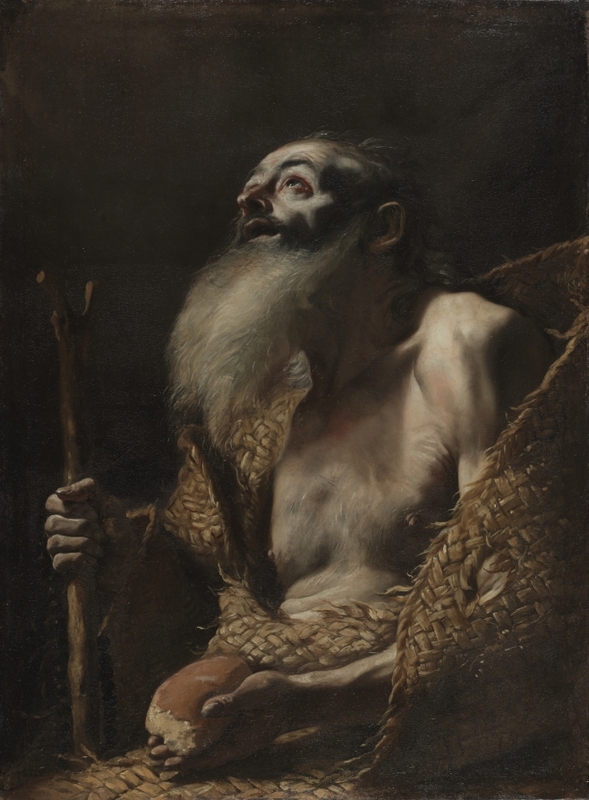 Thirteen years prior to this event, the Wild man was know as Mum the hermit. He got this name because when anyone would see him he would say "Mum's the word". According to the newspaper article he lived in Paducah county. The thing is there is no Paducah county, so we have to assume it means Paducah Kentucky in McCracken County. It is said that the Wild man, or Mum, lived in an old pine hut in the woods. That he had lived there for around 5 years or more and was seldom seen. It is also said that he later abandoned the pine hut and moved into a cave under a ridge known as "Lizard Rock". Over the years Mum was seen by a few hunters. They said he did not have any clothes on and ran into his cave. There is also one story of a farmer who was missing a young calf and two sheep. The missing critters were tracked to Mum's cave and the calf and sheep, were never seen again. It was also said the Mum would run away from humans, but the sight of animals did not bother him. Now, here is how the two men captured Mum. Harvey and Boyd built a trap for Mum in the woods. Once Mum have been captured it took two days to get him accustom to the presents of the two men. Boyd and Harvey explored Mum's cave, a place where Mum was said to have lived 7 or 8 years, and found numerous small animal bones and over 50 snake skins. Now more of the story. According to Boyd and Harvey, the Wild man, was originally from North Carolina. That he had been a sharp shooter in the war. But shortly after the war he murdered a whole family of settlers and fled. The actual name of the man was never stated in the article. Now, while some want to say this man was a Bigfoot, it seems pretty clear he was human. That is if the story is even true at all. But what caused this person to go off the deep end? Was it the war? Was it the killing of the settlers? Or could it have been some kind of mental illness or maybe even some kind of head trauma? We may never know the answer. If this story is true, I think we can all agree his behavior became more animalistic than human. That he seemed to survive living alone in the forest with no tools and at times with no clothes. It seems as if in some ways his body adapted to his environment. Its funny, I know of a person who almost fits this description of the wild man. This fellow is extremely odd in appearance and actions. I have no idea where he actually lives, but I know the general area. I know where he is from. You will see him walking 30 miles away from his home area. He will dig through garbage cans and drink whatever he can find in them. I have seen this with my own eyes. I have had others tell me he even eats old food he finds in garbage cans. He has a thick head of hair and a very thick beard. He wears the same raggedy clothes every day. I've known of him and seen him for the around 12-13 years. I don't think I have ever heard him speak. He will refuse any help you offer. He has many actions that are animal like. Its kind of weird, but he don't bother anyone as far as I know. I guess he could be considered a modern day Wild man. So, there you have it, more information on Mum the hermit. I have never really researched this story in great detail. What do you make of Mum the Wild man Hermit?